Andy Warhol (August 6, 1928 - February 22, 1987) was an American artist who was a leading figure in the visual art movement known as pop art. His works explore the relationship between artistic expression, celebrity culture and advertisement that flourished by the 1960s. After a successful career as a commercial illustrator, Warhol became a renowned and sometimes controversial artist. The Andy Warhol Museum in his native city, Pittsburgh, Pennsylvania, holds an extensive permanent collection of art and archives. It is the largest museum in the United States dedicated to a single artist. As soon as you stop wanting something you get it. I've found that to be absolutely axiomatic. Before I was shot, I always thought that I was more half-there than all-there- I always suspected that I was watching TV instead of living life. People sometimes say that the way things happen in the movies is unreal, but actually it's the way things happen to you in life that's unreal. The movies make emotions look so strong and real, whereas when things really do happen to you, it's like watching television- you don't feel anything. Right when I was being shot and ever since, I knew that I was watching television. The channels switch, but it's all television. Being born is like being kidnapped. And then sold into slavery. People are working every minute. The machinery is always going. Even when you sleep. During the 60s, I think, people forgot what emotions were supposed to be. And I don't think they've ever remembered. Dying is the most embarrassing thing that can happen to you, because someone's got to take care of all your details. I don't see anything wrong with being alone, it feels great to me. I usually accept people on the basis of their self-images, because their self-images have more to do with the way they think than their objective-images do. I'm a deeply superficial person. I've never met a person I couldn't call a beauty. Sometimes people let the same problem make them miserable for years when they could just say, "So what." That's one of my favorite things to say. "So what." When people are ready to, they change. They never do it before then, and sometimes they die before they get around to it. You can't make them change if they don't want to, just like when they do want to, you can't stop them. It's not what you are that counts, it’s what they think you are. Warhol died in New York City at 6:32 am on February 22, 1987. According to news reports, he had been making good recovery from routine gallbladder surgery at New York Hospital before dying in his sleep from a sudden post-operative cardiac arrhythmia. Prior to his diagnosis and operation, Warhol delayed having his recurring gallbladder problems checked, as he was afraid to enter hospitals and see doctors. 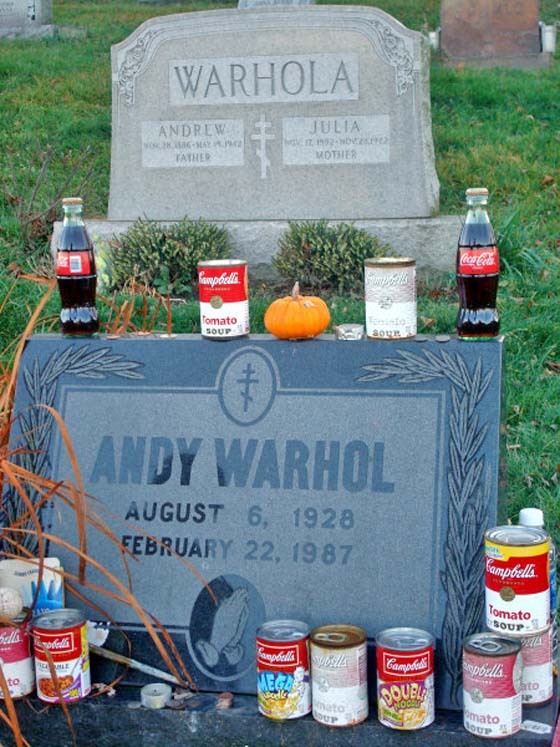 Warhol is buried at the St. John the Baptist Byzantine Catholic Cemetery in Bethel Park. It's located right behind PAT's Washington Junction light rail station. To get there from Library Road (Route 88), turn on to Connor Road. In about 250 feet, there's an unmarked intersection. On the right is Willow Avenue; on the left is the entrance to the cemetery. His grave should be easy to spot; visitors leave cans of Campbell Soup and other gifts. Or plug the following into your GPS: N 40° 21.266; W 080° 01.790.